Hello everyone, Joni here! 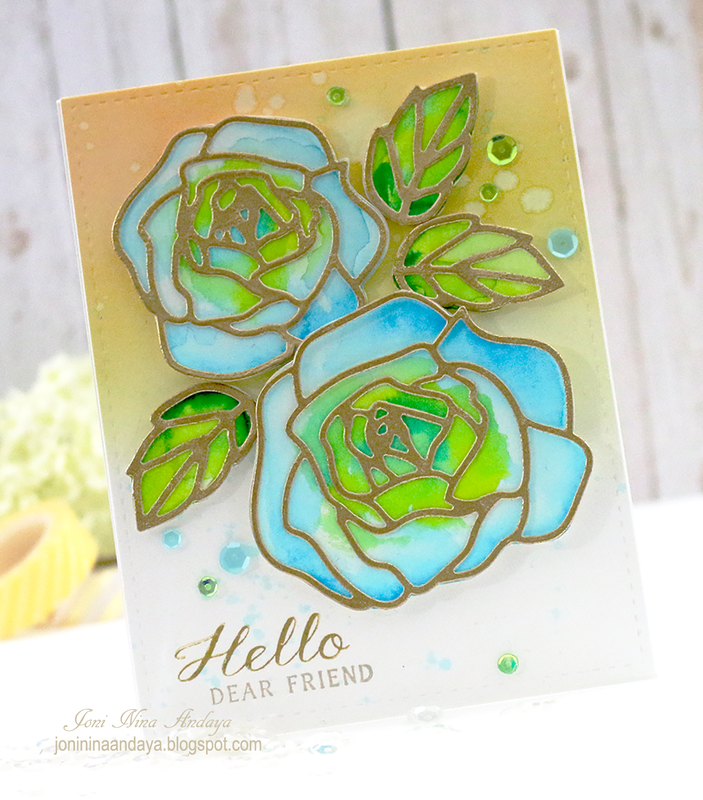 I'm back for more inspiration using the new Outlined Roses Die for my focal point and Beautiful Bouquet: Dahliastamp set for the sentiment. 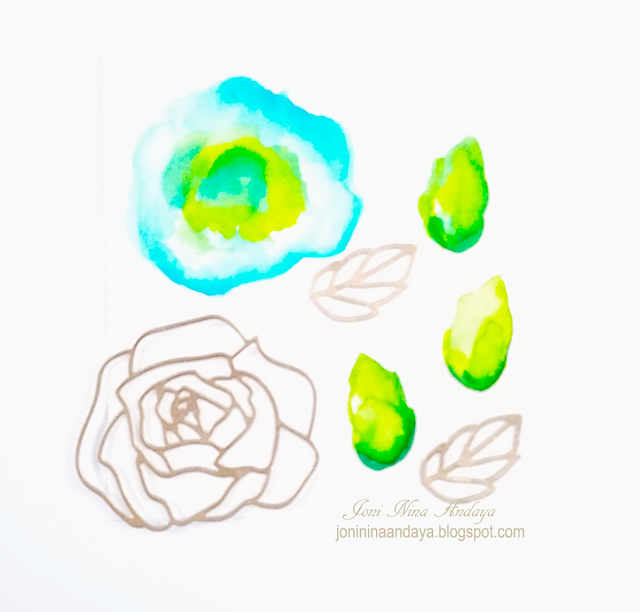 To begin, I first traced the flower and leaves die from Outlined Roses Die on watercolor paper. Next, I fussy cut and then watercolored using ZIG CLEAN COLOR Real Brush markers. I used the 60 pack which I picked up at prettypinkposh.com. I die cut the roses and leaves and the outline images were heat embossed with gold embossing power and adhered with glue on top of the watercolored images. For the background, I distressed the white cardstock panel with Distress ink in Fossilized Amber and Spun Sugar. Then I splattered with water and some left over ink from the ZIG CLEAN COLOR Real Brush markers for effect. I stamped the "Hello" sentiment from Beautiful Bouquet: Dahlia using PURE COLOR dye ink in Old Gold, and stamped "Dear Friend" in Silver Lining. Then I die-cut this panel with the Gifts Card Layer Die. To finish off the card I added some iridescent sequins in 4mm and 6mm Peridot Mist, and satin sequins in 4mm and 6mm Aquamarine. I hope you guys enjoyed today's project! Thanks so much for stopping by, and have an awesome weekend! Hi there! 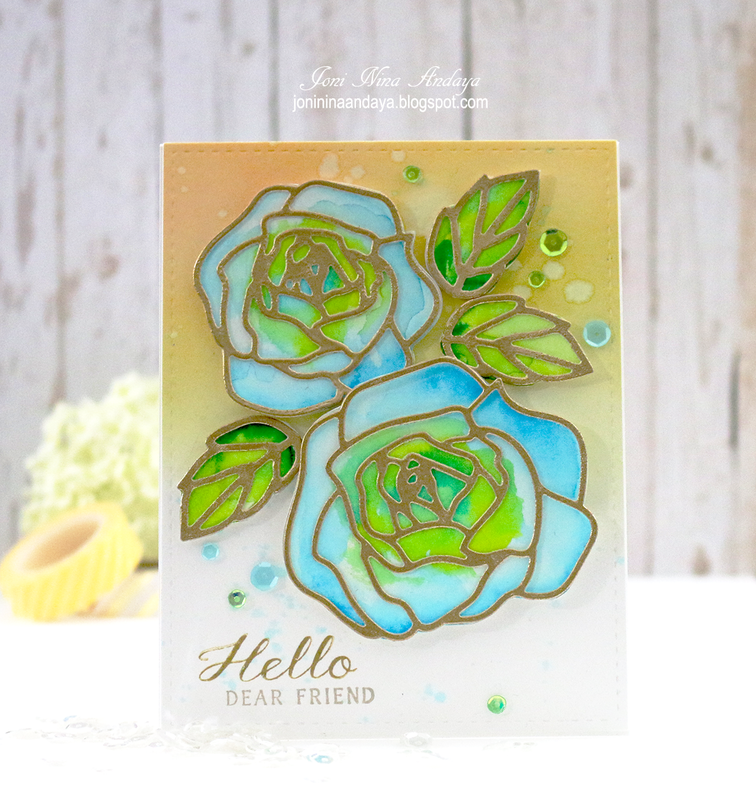 It's Audrey from Pink Ink Originals here today with a fun card to share with you using the new You Equal Kind stamp set and companion dies. I started off my card by watercoloring an ombre background using my Zig Clean Color Real Brush Markers. While that was drying, I stamped a bunch of the outline flowers from the You Equal Kind stamp set onto watercolor paper using waterproof black ink. I colored those with my Zig markers also, and then diecut them with the coordinating You Equal Kind dies. 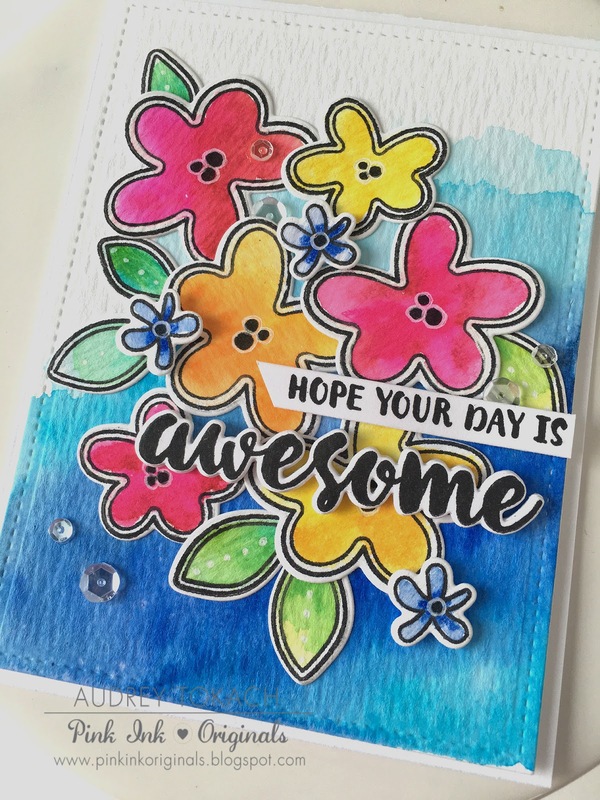 I stamped the flower centers ink black ink and then used a white gel pen to outline them. When I had the placement how I wanted it, I glued the medium and large flowers and all of the leaves down with a glue pen. For the sentiment, I stamped “Hope your day is” on a thin strip of white cardstock which I adhered with foam tape. Then I stamped “awesome” in black ink on white cardstock and diecut it. Rather than trying to cut tiny strips of foam tape, I diecut “awesome” 5 times out of white cardstock and glued them all together in a stack to get the dimension that I was wanting. I added the small blue flowers with foam tape, and finishing things off with a scattering of sequins before mounting the panel onto a white card base using foam tape. Hi, It's Maureen here. 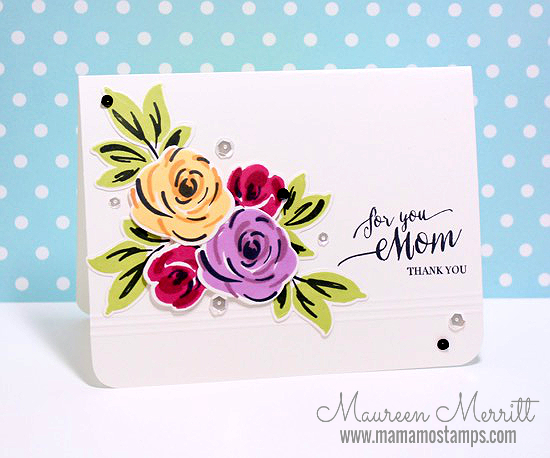 I'm stopping in today to share a Mother's Day card that I made using the newly released Freehand Florals stamp set. This is one of those stamp sets that you can achieve a different look each and every time you use it. Stamping three shades of the same color or similar colors, results in a soft, more natural look. While adding the smallest layer in black gives you a more graphic look like I've done here. 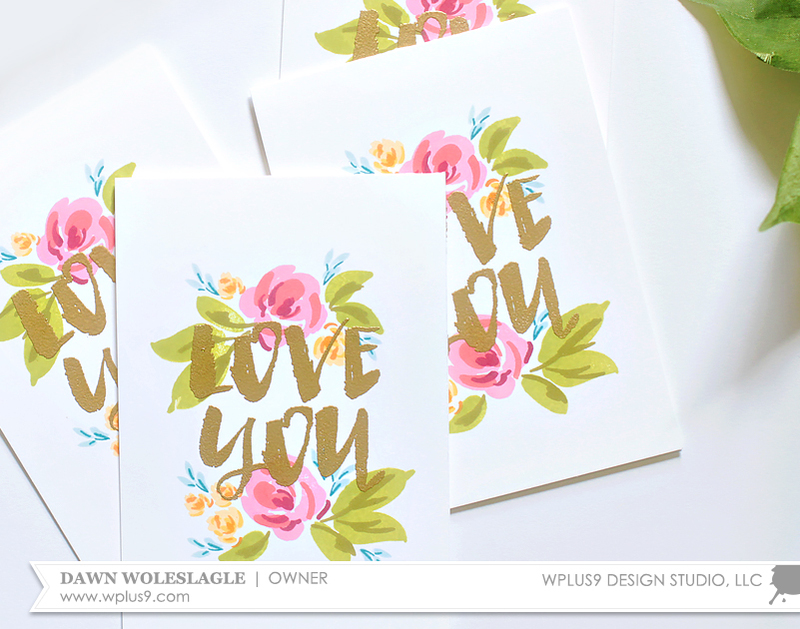 Placing the bold florals on a white card base and pairing it with a simple sentiment stamped in black really makes this clean and graphic design pop. 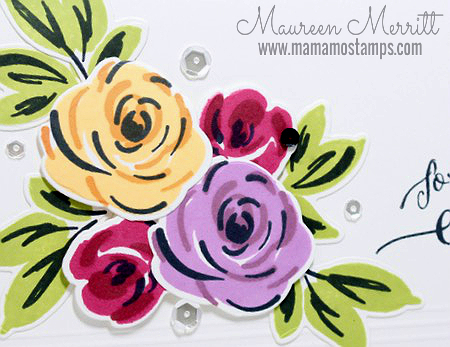 Try different color combinations with your Freehand Florals and see what style you like best! It's no secret that I have an obsession with vintage florals paired with modern/graphic patterns. Although I didn't use any additional patterns today, I think that a nice modern font can serve a similar purpose. I paired the newly released Biggest Fan with Freehand Florals. And good news, we are expecting a new shipment of Freehand Florals this week! This simple one layer design is easy to mass produce but has such an impact. Stamping out each card was quick and and easy thanks to the MISTI. 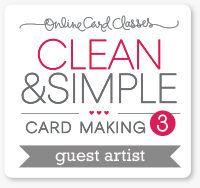 I used the MISTI to stamp out the base layers of my design on each card. This made sure that each card was stamped in exactly the same place. The sentiment screamed out for gold embossing to me. I just can't get enough of these brush fonts.